I really appreciate Drs. Iñigo Sanchez Garcia, Joaquin Medina, and Jesus Vincente Carbajosa for their kindness to take me to the locality of Cynomorium coccineum. 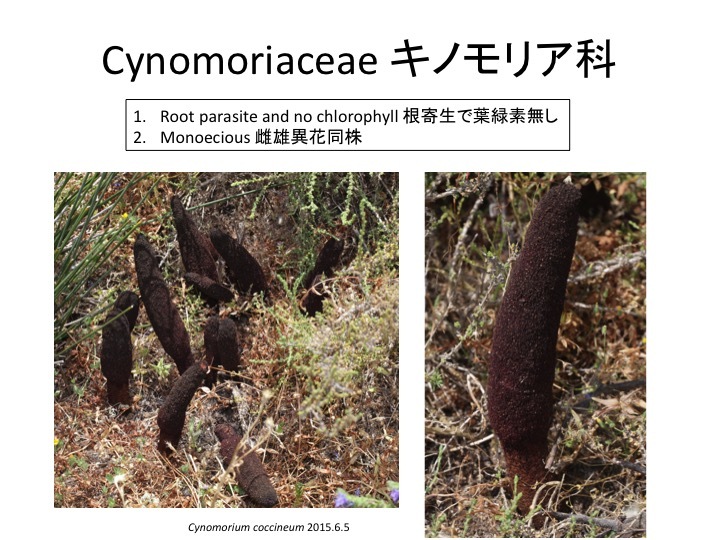 The Cynomoriaceae contains only two species, even though they are widely distributed from Mediterranean to Central Asia. Studies on genetic diversity in this family may reveal some cryptic species. 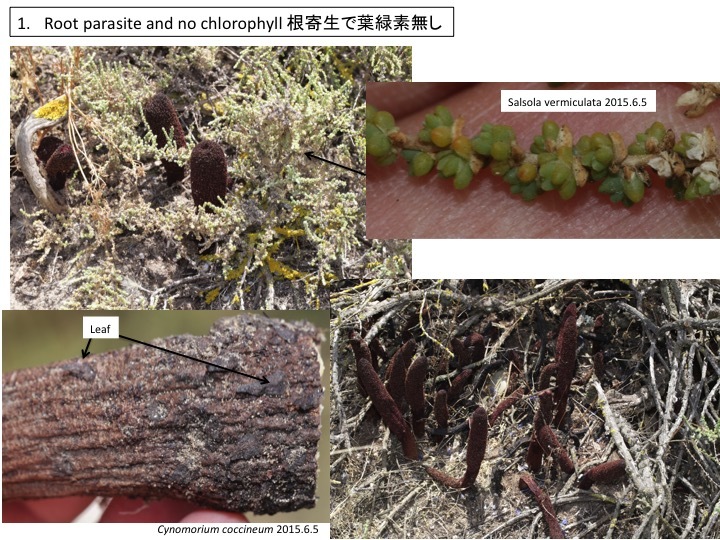 Phylogenetic position of the Cynomoriaceae is still ambiguous. Inverted repeat structure of chloroplast genomes supports a sister relationship to the Rosaceae (Zhang et al. 2009; Moore et al. 2011) but phylogenetic inferences with nuclear ribosomal DNAs and mitochondrial genes support close relationship to the Crassulaceae (Barkman et al. 2007; Nickrent et al. 2005). Barkman, T.J., McNeal, J.R., Lim, S.H., Coat, G., Croom, H.B., Young, N.D., DePamphilis, C.W. 2007. Mitochondrial DNA suggests at least 11 origins of parasitism in angiosperms and reveals genomic chimerism in parasitic plants. BMC Evol Biol 7:248. Moore, M.J., Hassan, N, Gitzendanner, M.A., Bruenn, R.A., Croley, M., Vandeventer, A., Horn, J.W., Dhingra, A., Brockington, S.F., Latvis, M., Ramdial, J., Alexandre, R., Piedrahita, A., Xi, Z., Davis, C.C., Soltis, P.S., & Soltis, D.E. 2011. Phylogenetic analysis of the plastid inverted repeat for 244 species: Insights into deeper-level angiosperm relationships from a long, slowly evolving sequence region. Int. J. Plant Sci. 172: 541-558. Nickrent, D.L., Der, J.P., and Anderson, F.E. 2005. 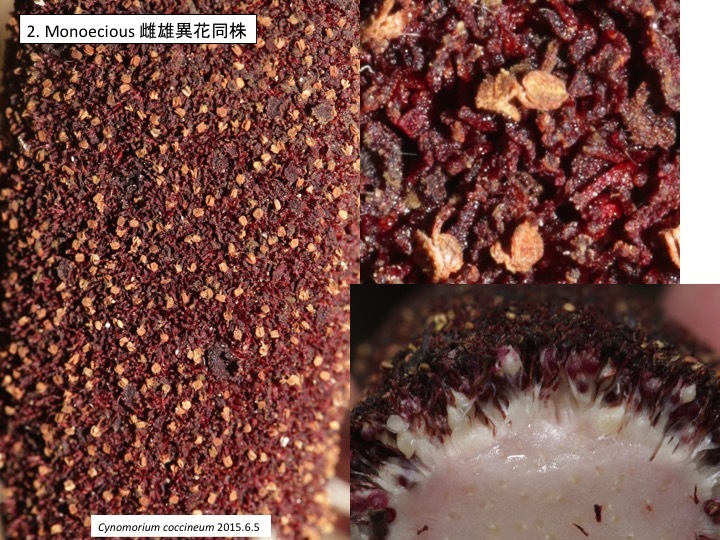 Discovery of the photosynthetic relatives of the “Maltese mushroom” Cynomorium. BMC Evol Biol 5: 38. Zhang, Z.-H., Li, C.-Q., and Li, J. 2009. Phylogenetic placement of Cynomorium in Rosales inferred from sequences of the inverted repeat region of the chloroplast gene. J. Syst. Evol. 47: 297-304. A host plant of Cynomorium coccineum in this place is Salsola vermiculata in the Polygonaceae. Cynomorium also has host plants in the Asteraceae, Tamaricaceae, Fabaceae, and Plumbaginaceae. Salsola verniculata sometimes die likely because of Cynomorium. Male, female, and hermaphrodite flowers are formed (Nickrent et al. 2005). Tepals are tiny and what is their function? Nickrent, D.L., Der, J.P., and Anderson, F.E. (2005). 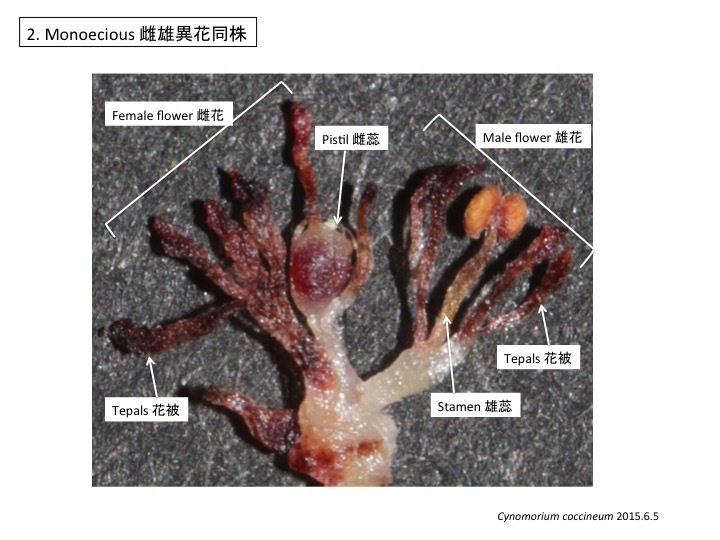 Discovery of the photosynthetic relatives of the “Maltese mushroom” Cynomorium. BMC Evol Biol 5, 38.